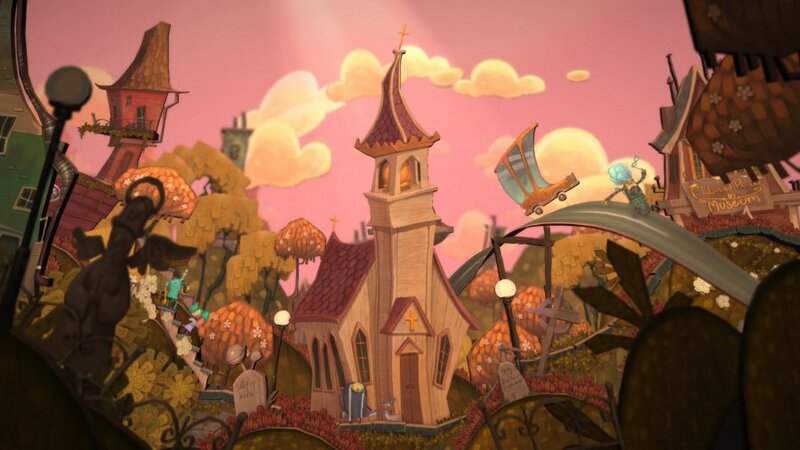 2013’s Stick It to the Man was among the PlayStation 3’s indie swansongs when it released four days after the North American launch of the PS4, but that didn’t manage to overshadow what we thought was a short but quality experience at the time. After busying itself with various other projects, developer Zoink! 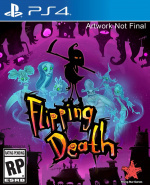 Games is back with Flipping Death, another 2.5D puzzle platformer that comes with a neat twist. You are Death, and there’s some ghostly spirits about looking to find peace. But before we get into that, you should probably hear the full setup. After being fired from her job at a Funeral Home for “trying to liven things up”, Penny decides to cheer herself up by taking a late night drive with her boyfriend. After crashing next to a graveyard, Penny decides to take shelter inside a crypt, which promptly crumbles and sends the raging teen to her death. 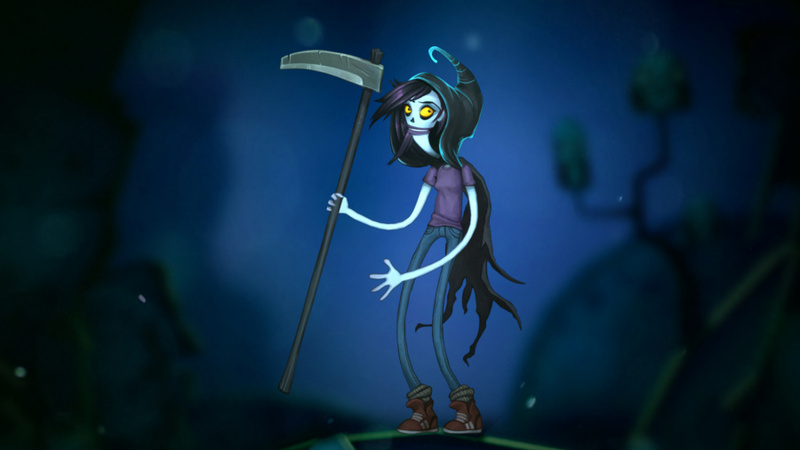 After awakening in the underworld, Penny comes across Death itself, who mistakes the girl for its long-lost temp, quickly handing over the scythe so that it can go on holiday. With the grim reaper’s hat and weapon in hand, it’s your job to help the ghosts you come across in the underworld tie up any loose ends and move on from the sense of limbo. This is accomplished by solving their problems that still persist in the real, breathing world, which is what helps to form the main mechanic driving the experience. To solve an issue, you need to possess a person whose heart is still beating, and when this is achieved, the entire world will literally flip and place you on the other side of life. From here, you can carry out the wishes of the dead in the weirdest of ways. You’ll explore a fairly open-ended environment, choosing to possess various characters whom all come with their own ability in order to complete various quests and tasks that’ll affect both the living and the dead. The key to achieving this though is order, as a certain sequence of events must take place in order to trigger the correct parameters of the objective. One or two tasks can be a little obtuse but with a visual hint system available to help out if you’re ever stuck, a helping hand is never too far away. Even if it does make its brainteasers a bit too trivial. It’s a fun adventure overall that has you doing all manner of things, but that’s also perhaps its biggest weakness. Flipping Death is consistently good for its seven or so hour runtime, but it never feels like it goes above and beyond in terms of leaving an impression. There’s reliable enjoyment to be had for sure, but we can’t picture ourselves reminiscing about its accomplishments six months down the line. It’s a pleasant experience in the moment, but lacking in terms of truly memorable scenes. What does fare a little better however is the dialogue and voice acting that gives the people you meet their personality. Much like Zoink! Games’ previous outings, the game takes on a humorous tone that is guaranteed to have you chuckling every so often thanks to a cast of characters that know how to deliver a joke or two. To further enhance the effect, Penny can communicate with the people she possesses by being the voice inside their head, which helps to create even more comedic scenes. If the gameplay isn’t really doing it for you, then at least the playful banter is enough of an inspiration to make it to the next comical interaction. 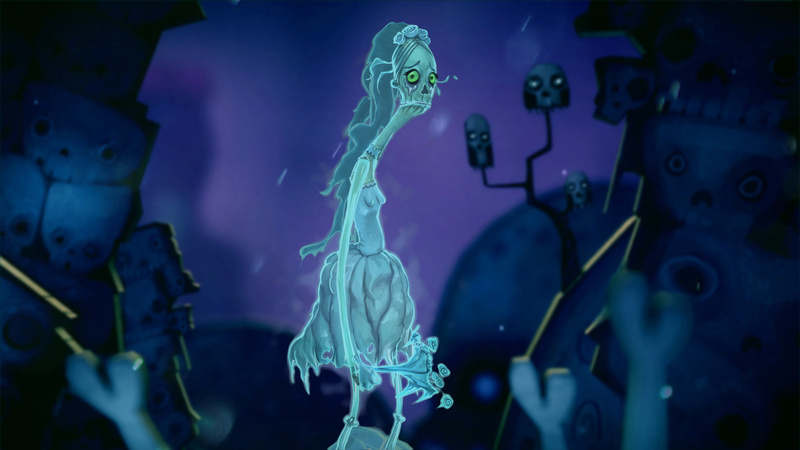 Much like Stick It to the Man, Flipping Death’s art style resembles that of cardboard cut outs. It’s a lovely look that certainly stands out among other 2D titles, and along with the flipping of the world when crossing the border between life and death, it makes for a visual spectacle. Not only does the world itself represent the polar opposites of life and death, it’s also reflected in the cast. Those on the bright side of life will look upbeat and happy while the spirits caught in limbo will be gloomy and negative. It’s a small detail, but it’s one that helps to cement the contrast the game is conveying. Flipping Death isn’t the grandest 2.5D experience you’ll play in 2018, but it does offer a fun account of the trials and tribulations of being both alive and dead. And with a fantastic cast of characters on hand to deliver quality and humorous dialogue, a laugh is never too far away. It's more than worth a look if you like what you see, just don’t expect anything too special. I enjoyed Stick it to the Man! a lot when it first came out. This looks like more of the same, so I'll pick it up at some point I imagine. It sounds good but realistically I'm never going to play. A shame. 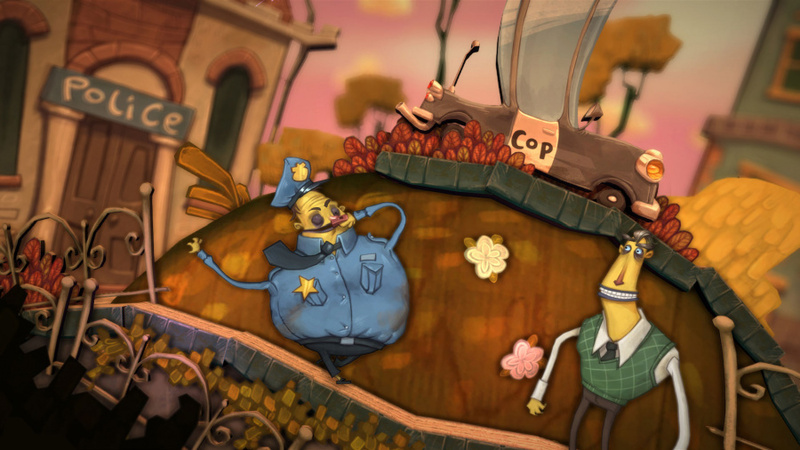 To be honest Stick it To The Man was probably one of my favourite PS Plus games. Been interested in this since they announced they were working on it and I'm loving the fact they have stuck to the same artstyle for the game.Will definitely pick this up at some point. @ShadowWarrior Metacritic has at at an 8.0 average. So one reviewer grading it a point higher, the other one lower isn't surprising to me, if you consider personal preferences for style, genre, etc, right? @Wazeddie22 Fully agree! That was a treat from Sony, that I would never have known to pick up otherwise. Can't wait to play this one, as it looks to be at least as good. Completely forgot this came out despite it initially being one of my most anticipated games of the year. Stick It to The Man! was one of the first PS4 games I loved (thanks to it being on +). Will definitely be playing this soon. If only I can drag myself away from the hunt.. Stick it to the Man is on my wishlist- Ill have to give it a try soon. Stick it to the man was great and I adore this art style. Will check this out once it's within my price range. @ShadowWarrior Seems like they enjoy fun more. @ShadowWarrior NL gives out 9s like they candy. That said, this review could easily have been written for that game as it had the same pluses and negatives as this game seems to. May well pick it up at some point. Looks cool, will pick it up eventually, really like their visual style.